New York, NY Practice: Bernstein Medical, PC Address: 110 East 55th St. 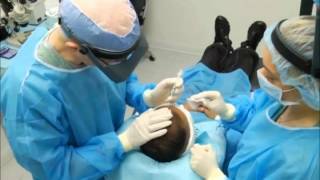 In Part 1 of our three-video series on Follicular Unit Extraction (FUE) at Bernstein Medical – Center for Hair Restoration, Dr. Bernstein walks us through the preparation of the patient’s donor area for an FUE hair transplant. This includes shaving the hair in the donor area to 1-mm in length and administering anesthetic for the robotic hair transplant procedure. In Part 2 of our three-video series on FUE hair transplantation, Dr. Bernstein describes the recipient site creation process in detail. He explains why, in FUE procedures, the recipient sites are created before the follicular unit grafts are extracted from the donor area. “Pre-making” recipient sites is a key improvement to the FUE procedure that Dr. Bernstein was the first to describe in medical literature. It is beneficial in several ways, the most important of which include reducing the overall time grafts are out of the body and creating a “fertile bed” for the follicular unit grafts. Both of these processes contribute to increased graft survival. 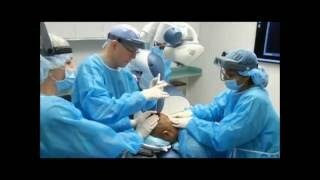 In Part 3 of our three-video series on FUE hair transplants, Dr. Bernstein narrates as he and his team of assistants prepares the patient for graft harvesting by the ARTAS Robot for FUE. This includes positioning an apparatus called a tensioner on the donor area, administering tumescent fluid to the dermis, programming the robot for the specific procedure and aligning the robotic arm over the donor area. As the robotic extraction commences, Dr. Bernstein discusses the reason why the robot is tasked with extracting only 2-, 3- and 4-hair follicular units while avoiding the smallest 1-hair grouping. He also discusses the robot’s 2-step extraction procedure in which a 0.9mm sharp punch is used to score the skin and that is followed immediately by a 1.1-mm rotating blunt punch to dissect the deeper portion of the grafts from the surrounding skin. Watch as Dr. Bernstein describes the actions of the robot as it uses its specially designed image-guided sensors to select the next graft, position itself to follow the angle of the hair, then use the 2-step technique to dissect out the follicular units. After the robot performs the extraction, Dr. Bernstein’s team uses special forceps to remove the follicular units from the scalp and place them first in Ringer’s Lactate and then in chilled HyperThermosol-ATP a medium designed to prolong the life of the grafts after they have been removed from the scalp.